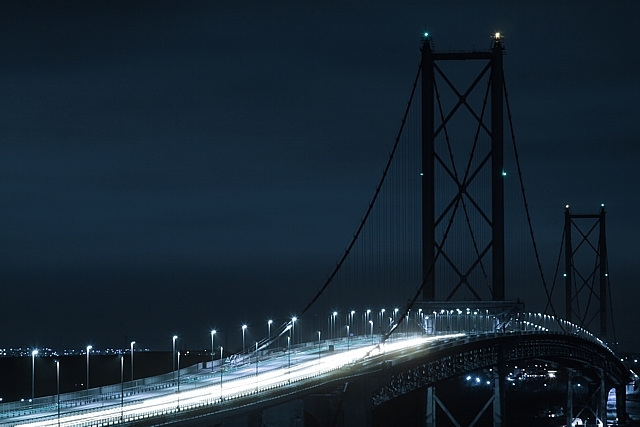 Another one of the Forth Road Bridge. I was playing with white balance for a long time, most of the sky is lit a very warm orange by the city lights... in the end, there's only so much you can do with colour temperatures so i used the channel mixer to swap round the three colour channels (basically an invert, but without flipping light and dark as well). Love the cool tones. Stunning image. Love the curves and shapes seen in this composition. The curves of the bridge allow the eye to pleasently coast over this bridge as we explore the photo. Our eye also travels up to the top most portions of the bridge. There we see the Retangular support struct/'towers' that contain black outlined diamond shapes amounst the backdrop of the night sky. Tones and hues are lovely and appealing. Great capture. The lights look so white, not off-white or yellow! haha clever. had to look closely for the tangent. Love it. 10! I have this one ftw. Nice curved lines, wondering if you could have caught some light in the sky and still maintain the contrast with the roadway. GREAT TITLE. I love this. The silvery light on the blue sky and water is gorgeous. Nicely captured. Brilliant title; all are suggested here. Also just a stunning image in general. 10.
i see think one in the top 3. ^^ lovely colors. love the blue hue. Proudly hosted by Sargasso Networks. Current Server Time: 04/19/2019 11:29:22 PM EDT.